Malcolm Craig cast his eyes over the first few rows of the audience in St Mary’s Church Hall. There were few signs of the latest liberated fashions of the twenties amongst the women in this staid, largely middle-aged crowd. Even most of the young women there were clad in the fashions and sombre colours of the previous decade. Not many flappers, with bobbed hair and close-fitting cloche hats were to be found in this conservative crowd. Many of those in the audience were still mourning the loss of their loved ones who had died in the Great War or had come home physically or mentally maimed. Others had succumbed to the Spanish ‘flu pandemic at the end of the decade. The only vanity the women displayed were cumbersome ornate hats which blocked the view of the stage to those seated behind them. He was reaching the climax of the aria from La Bohème where his full attention should have been on the delicate high note at the end of the aria, when he caught sight of Felicity at last. She was further back than he had expected, seated demurely between her stern father and her scrawny twittery mother. Her two younger brothers completed the Gregory family party who were present at St Mary’s especially to hear Felicity’s young man singing. Malcolm was going to London the following week to begin rehearsals for the new season of the touring Kings Opera Company. Despite his outstanding voice, his singing would be confined to the chorus, with only the occasional small role to fulfil, and although he would be given leading parts to understudy it was unlikely that many of the principals would be absent and give him a chance to stand in for them. He took the last note of the aria in a delicate falsetto, and the audience erupted into cheers for Mr and Mrs Craig’s’ gifted son. He acknowledged the applause gracefully and drew his accompanist, the old Church organist and choirmaster, who had known Malcolm since his early days as a mellifluous boy alto, forward to receive his share of appreciation for the performance. He looked directly at Felicity and was gratified to see that she was applauding wildly. With the lights up, he saw that her face was flushed and her eyes were shining. She was aglow with the unaccustomed excitement of the occasion. All this applause was for her boyfriend who had acquitted himself beyond everyone’s expectations in his first solo recital. Tea would be served to the audience after the concert, as it was on every occasion. The vicar believed that half the people present came to enjoy the liberal tea rather than because they were really interested in the event itself. Already stalwarts of the Mothers’ Union were gathering in the hall kitchen, competing with the applause as they clattered cups and saucers into position on the long trestle tables. The last thing Malcolm wanted to do after his recital was to make polite conversation with his large family and Felicity and her parents over a cup of weak lukewarm tea and a slice of seed cake. He wanted Felicity all to himself, to hold her tightly in his arms and see her rejoice in his good fortune. But he knew he would have to break the news of his change of career to them before he could relax and enjoy the success of the evening. He joined his parents and his older brothers and sisters, as they waited for tea to be served. Already he was feeling far more nervous about the ordeal to follow than he had been about giving the recital. His father growled in agreement and his older sisters and brothers crowded round him, eager to be associated with their talented and attractive young brother, who, at the age of twenty, towered above his parents and siblings. The vicar creaked up the stairs to the hall stage during the tea. He called authoritatively for silence so that he might give his prepared vote of thanks to Malcolm. He announced triumphantly that the Church had raised a considerable amount towards the Organ Fund from the proceeds of the concert. Gloved hands applauded warmly, if mutely, and Malcolm smiled modestly, silently acknowledging the gratitude of the congregation. Some of Malcolm’s old school mates approached him diffidently. 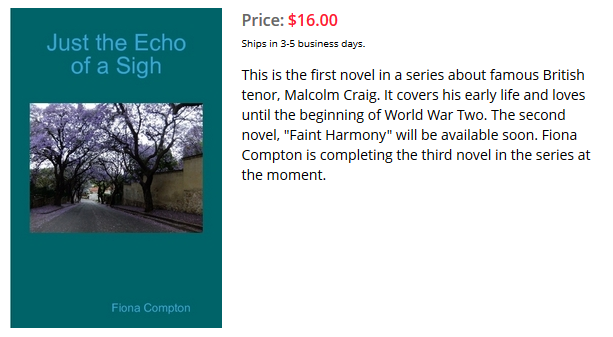 When they were younger they had been his boon companions, cheering themselves hoarse in support of the local football team, but now Malcolm’s burgeoning gift set him apart from them, although he himself had not changed for he had always been able to sing. Since he had begun serving articles in a Birmingham firm of accountants, studying singing in his spare time and singing tenor solos for various choral societies, he had not had time to go to football matches any more. He had also been advised that he could ruin his voice if he cheered on his team with abandon every week. He reached Felicity at last, relieved to see that her parents were momentarily away from her, doing their duty by mingling with their middle-aged, middle class companions. “Always for you, darling,” he replied hoarsely. 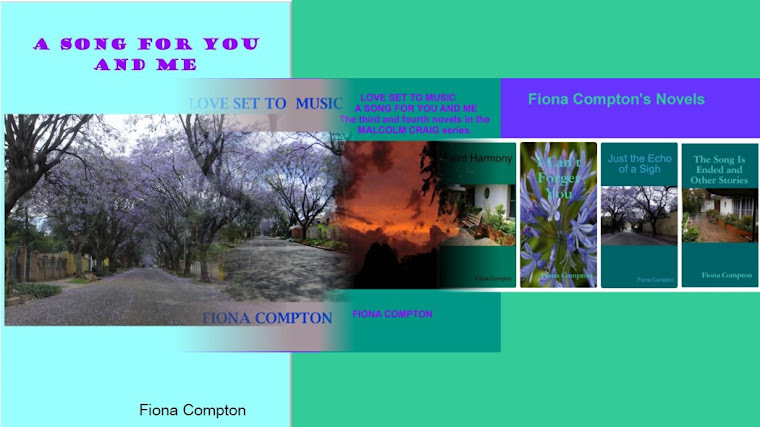 This book is available at Fiona's Store as a paperback or as an epub ebook.